Railways of the World is the new base game for the system and will include the engine placards, railroad tiles, train tokens, money, bonds, and other items that will be needed in almost all "Railways of _____" games. The game board depicting the eastern half of the United States, is included in the base game. The map of Mexico will be mounted and is still included in this base game as an introductory map for new/beginner players. This is a game where carefully building a network of railroad links between cities is paramount. The object of the game is to move goods from one city to a target city (based on the color of the city/good). Players do this by linking the cities together with railroad tracks. Players only get 3 actions each turn, thus giving the player some tension in deciding the optimal play for the turn. For each link traversed in the delivery of a good the player whose link was used gains a point on the income track. After everyone has taken their three actions there is an income phase. Players have to issue bonds when they need money, and they pay back each bond each turn, so gaining independent income is rather important. Players do not start the game with money, so debt is inevitable, but controlling how much debt one incurs is part of the game. The game has a good depth of strategy, and no two sessions will play out the same since the goods are randomized each game. There is a good balance between upgrading engines, building tracks, and delivering goods, combined with the income track which increases in value until the midpoint, and then decreases. The income track doubles as the victory point board, so one does want to increase to win the game, but increasing too fast too soon will deprive you of money. The game is not too deep as to prevent people from playing it, yet it is by no means light. A good strategy will be clearly rewarded. The game is somewhat unforgiving for bad play, but there is room and time to recover and put up a good fight. Railways of the World (RotW) takes place in the 19th century during the golden age of the railroads. Players take on the role of rail barons who are trying to build a rail empire. Players take out bonds to build track and upgrade locomotive engines in order to deliver goods and obtain income. The theme is well represented in the game. The object of the game is to score the most victory points (VPs) by delivering goods, constructing major rail lines and achieving a Railroad Baron objective. RotW is for 2 to 6 players ages 12 and up and plays in about 2 hours. The components are excellent, hats off to Eagle Games. I cannot rave enough about the components. There are two different mounted beautiful boards. The Railways of Mexico board accommodates 2 or 3 players and the Railways of the Eastern US board is used for 4 to 6 players. There are thick cardboard tokens, hard and soft plastic playing pieces, wood cubes, a cloth bag, well detailed paper money, and fairly durable cards. There are separate Railroad Operations and Railroad Baron decks for each board. The artwork on the cards is below average but does set the theme. The rulebook is only 5 pages and well written and organized. The rulebook also has some examples of play. Set-up for RotW is easy but takes a moment. Each player receives their playing pieces and is dealt two Railroad Baron cards. The Railroad Baron cards have a secret objective that the player can obtain for VPs. Each player chooses one Railroad Baron card and discards the other. Each city on the board is seeded with the indicated number of goods cubes, the indicated number of empty city markers are set aside and the Railroad Operations deck is shuffled and the indicated number of cards drawn and placed face up near the board. The youngest or most inexperienced player becomes the first player. The current First Player starts the auction and bidding proceeds in clockwise order. Each player must outbid the previous bidder or pass. Bids are made in $1,000 increments. The player who made the highest bid pays the amount he bid to the bank and becomes the First Player, receiving the First Player card. Build Track: Build up to four track tiles to create ‘links’ between cities. The cost to build each track tile depends on the terrain in the hex where the tile will be built. The player places one of his playing pieces on the link to claim ownership. Urbanize: Place a New City tile and two random goods cubes in any gray city. It costs $10,000 to urbanize. Upgrade Engine: Increase the engine level of your locomotives. The higher the engine level, the more links a goods cube can be moved. Deliver One Goods Cube: Move one goods cube from up to your current engine level from one city to another city. The goods cube must be delivered to a city that is the same color as the cube. The active player as well as inactive players can gain income depending on which links were used to deliver the goods cube. Take Railroad Operations Card: The player can select one available Railroad Operations card. The Railroad Operations card give bonus VPs, discounts on building rail tiles, give additional actions and grant free urbanizations to name many. All players receive their income and must pay $1,000 interest on each bond they have. Incomplete links are removed, the round marker returns to the ‘1’ space and a new Railroad Operations card is drawn. The players are ready for the next turn. When the last empty cities marker is placed on a city without cubes, then the current turn is finished and one more full turn is played. At the end of that turn VPs are tallied and the player with the most is the winner. Railways of the World is an easy game to learn and play. It is a step up in complexity from Ticket to Ride, but not as complex as the 18XX games. In my opinion, it is a medium weight game with enough depth to keep veteran gamers interested yet not too much for a casual gamer to handle. There is a good amount of player interaction in RotW. Outside of the first player auction, players race to build major lines, use other players’ rail links, grab a Railroad Operations card before you can, or deliver a goods cube you had your eye on. RotW has high replay value. The initial goods cube seeding of the cities can change the feel of the game and make some areas of the board more attractive than other areas. You’ll probably have a different Railroad Baron secret objective every game and there is no telling what Railroad operations cards will be drawn during the game. I’d also like to point out that there are several expansion boards available to keep the game fresh. This game is a lot of fun and a big hit with my gaming group. The two hour game time always seems short, and I find myself hoping that the end game will not be triggered. 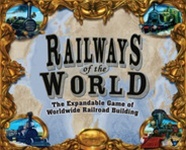 Railways of the World is a great game and would be an excellent addition to your collection. Railways quickly jumped to my Favorite Game spot. After first few plays (on Western US map), I realized that I had discovered a game system that I enjoyed immensely, regardless of how well I did. It was the Process that I enjoyed, the Gameplay. Not simple, but not complex either, Railways takes Pick Up & Delivery and Route-Building to the next level from Gateway games like T2R. Once players know the game, it can be played quite quickly too! The goods distribution and card draw order keep each game different from the last. I can’t recommend this game system enough to those ready for the Next Step! * Eastern USA (comes w Base Game) – 10. NE is a battle! Great map with 4-5P. * Mexico (also in Base Game) – 7. Good Starter Map for 2-3P. 2P is good, 3P is brutal & combative. Not my favorite. * Europe – 10. Tricky due to geography, but our favorite. Gets a bit nasty w/ 5P. Best w 4P. 3P is ok, but ends too quickly! There’s also a fan-made Military History Event Deck that we find really enjoyable. * England/Wales – 9. Very balanced, good for beginners. Good 3-5P. Geography makes it less confrontational. * Australia (fan variant) – 8. Ok w 4, best w 5. Very fun, “donut-shaped” map (5P forces people to leave the coast and go into the center. * Railways Through Time – 7. Neat twist on the game, lets players jump from board to board, each board representing a diff time period! * North America (Canada) – 8. Nice new map, mines are a good addition, ferries haven’t been a huge hit w us yet. * North America (Trans-Continental) – 5. A disappointment. Our resident Game Designer re-did it (as a Team Game on E.US & W.US simultaneous!) and we like his version a whole lot better. 9. * California Gold Rush (fan variant) – 9. Very fun, with interesting Gold Rush mechanic. A new favorite map! EVENT DECK – 10. Essential addition. Adds some randomness, but all thematic and you can customize the deck for your group’s taste. We don’t play w/o anymore. The most interesting aspect of this game is the way that you compete with each other in more ways then in some other games. Players bid for turn position at the start of each groups 3 rounds, can sabotage potential routes other players were going to build via environment cards, and can exploit the fact that others need to go through a specific city by buying a hotel there that gives them bonuses. It’s the system of laying out the tracks, trying to beat your opponent to the punch, and planning far in advance of your turn that makes this a very strategic game. For a first play, I had quite a bit of fun and it kept building from there until the end. In a group of 6, I came in second to last but I didn’t mind a bit. It was just simple fun. Add a Review for "Railways of the World"
1 30x36-inch mounted map of Eastern U.S.